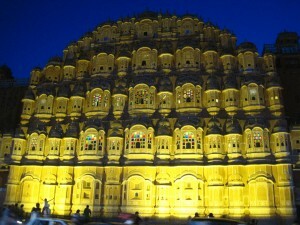 Rajasthan has always been a place, where I wanted to visit and spend some time. Its forts and palaces, rich culture, unique festivals and desert safaris are something I wished to explore. After waiting so many years, I finally got an opportunity to visit the princely state. The opportunity came to me as official trip and the idea of going there with my colleagues was so exciting that I started counting the days. Finally, the day approached when we were in this historical state which offers many attractions to its visitors. Some important cities which we could visit include Jaipur (the capital city), Ajmer, Udaipur, Mount Abu, Pushkar, Jodhpur, Jaisalmer and Bikaner. While exploring these cities, I came across some of the fabulous forts and palaces and many other famous tourist attractions, which I of course, would like to share with readers. Rajasthan is home to monuments including spectacular forts, palatial palaces, religious shrines, royal havelis and terrific temple. The architectural marvel of these monuments enthralls visitors from all over the world. All the cities are dotted with beautiful monuments. 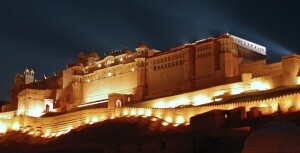 Some famous monuments of the royal state of Rajasthan are City Palace, Jantar Mantar, Hawa Mahal, Amber Fort and Albert Hall Museum in Jaipur, Mehrangarh Fort, Kumbhalgarh Fort and Umaid Bhawan Palace in Jodhpur, Lalgarh Palace and Junagarh Fort in Bikaner.We also loved to explore Golden Fort in Jaisalmer and Fort Mandwa Castle in Shekhawati during our Rajasthan tour. Having heard a lot about the wildlife of Rajasthan, I was eager to see it. However, due to short time in our hand, we could visit only Ranthambore National Park, situated in Sawai Madhopur. It is just 150 km from Jaipur. This wildlife sanctuary is a home to huge variety of birds, animals and reptiles. 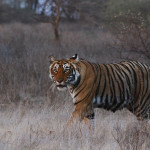 The park is popular for its tiger’s especially diurnal tigers. Fortunately, on our jeep safari, we could spot a tiger. The thrill, excitement and joy are beyond words to describe. 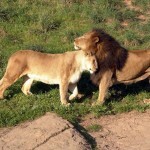 Other wildlife sanctuaries and national parks include names like Sariska Tiger Reserve, Bharatpur Bird Sanctuary, Desert National Park and Mount Abu Wildlife Sanctuary. 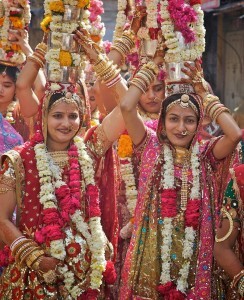 While we were on Rajasthan tour, we also got to know about some interesting festivals of the desert land. The state experiences the jubilation of some vibrant festivals. Some popular fairs and festivals of Rajasthan include Pushkar Camel Fair, Udaipur Elephant Festival, Jaisalmer Desert Festival, Jaipur Elephant Festival and Jodhpur Marwar Festival.Celebrated with great enthusiasm, these festivals reflect the rich culture and heritage of the state. The fairs and festivals are also major attraction of tourism, attracting many visitors to come during the festive season here. Like other tourists, we were also enthralled by the Sand Dunes here, which are among most appealing attractions of Rajasthan Tourism. We opted camel safari to explore the sand dunes which was indeed a good choice. The adventure took us to explore some traditional villages of Rajasthan like Bikaner, Jodhpur and Jaisalmer. Based on my tour experience, I would strongly recommend relishing the traditional Rajasthani Cuisines like Dal Bati Churma, Ghewar, Jodhpuri Mawa Kachori and Mirchi Vada. Truly it’s an amazing experience for us, which we will cherish for lifetime. 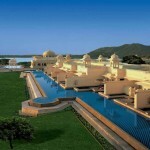 «Next Post Discover the Charm of Magnificent Forts and Palaces of Rajasthan!